With the exit of offensive coordinator Matt LaFleur, right, Titans quarterback Marcus Mariota will soon be working with his fifth OC in five seasons. If the Titans hire someone with a style different than what the team has been running, it might mean Mariota’s days also are numbered. Marcus Mariota can’t catch a break. His offensive coordinator, Matt LaFleur, was named head coach of the Green Bay Packers last week, leaving the Titans to search for play-caller No. 5 as Mariota heads into a make-or-break fifth season as Tennessee’s quarterback. Mariota’s injuries and health issues are well-documented and have created enough questions that the Titans probably won’t offer him a contract extension before the 2019 season ends. But with LaFleur exiting to join Aaron Rodgers in Green Bay, it leaves the Titans in a predicament with their quarterback inching toward free agency and possibly having to learn yet another system. In other words, it begs the question of whether all the changes inside Saint Thomas Sports Park are creating as many problems for the Titans’ would-be franchise quarterback as his injuries. Looking for a positive? Mariota will have to prove himself in 2019 with free agency looming. While Mariota doesn’t appear to be motivated by money the same way as, say, Albert Haynesworth or Chris Johnson when they played their best football for the Titans, there is something to be said for having to bet on yourself in a contract year to earn long-term security. Going back to LaFleur’s departure, many quarterbacks have had a tougher path and survived. Alex Smith went through five coordinators in five years and seven in eight years before finally finding some stability with head coaches Jim Harbaugh in San Francisco and later in Andy Reid in Kansas City. Mariota’s own understudy, Blaine Gabbert, knows the drill, too. Gabbert has now meandered to four different teams and gone through eight offenses in as many years. Whether the Titans keep him as Mariota’s backup again 2019, or if he goes elsewhere, Gabbert will have played for an amazing nine coordinator changes. Who the Titans pick to replace LaFleur – it’s been a quiet search so far – might reveal their long-term plans for Mariota. 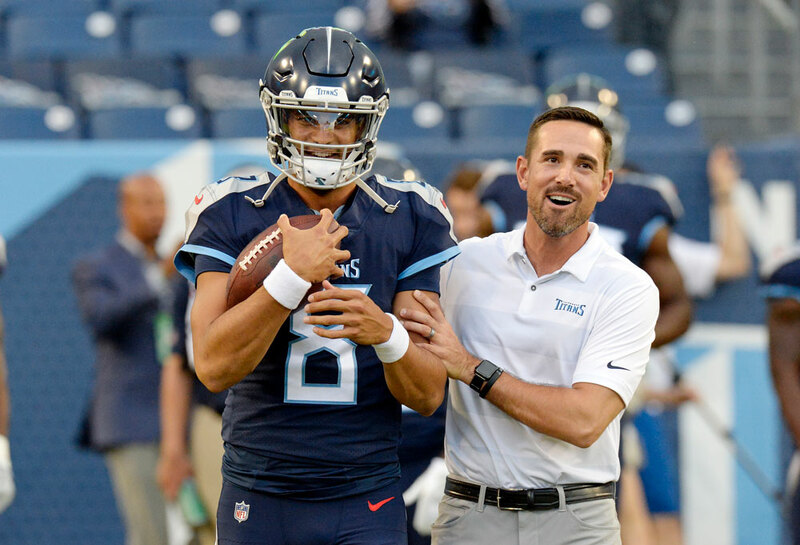 If someone in-house is promoted or an outsider who runs a system similar to what LaFleur brought to the Titans is hired, that could signal the Titans still value Mariota as their franchise quarterback, provided he can stay healthy. Choosing a coordinator with a different offensive philosophy could indicate the Titans are ready to look for a new quarterback. That would be a mistake, as Mariota is not a one-man team. Continuity is important to what is largely a young Titans offense. The constant turnover of play-callers and scheme changes also affects young players like Derrick Henry, Corey Davis and Taywan Taylor. Coach Mike Vrabel and GM Jon Robinson have a pretty good chance of producing a third straight 9-7 season in 2019. And, with a lucky bounce here, a tweak there and an uninjured Mariota, the Titans could take the next step or two toward being an elite team. Or, do they could hit the same wall as the previous coach, Mike Mularkey, who plateaued at 9-7 and was 1-1 in playoff games. That also ended with the Titans going in a different direction.